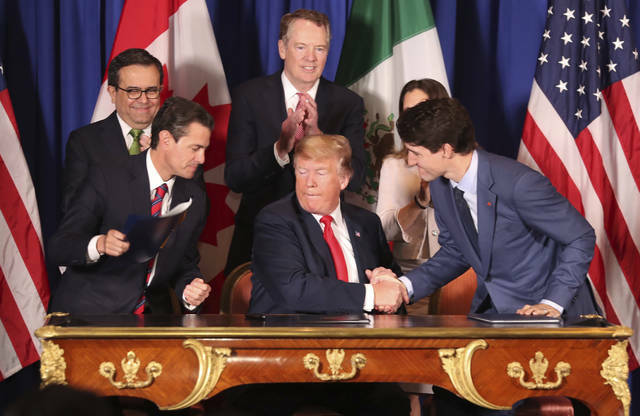 The U.S.-Mexico-Canada Agreement is meant to replace the 24-year-old North American Free Trade Agreement, which Trump has long denigrated as a “disaster.” However, ongoing differences over steel and aluminum tariffs the U.S. has imposed on its northern and southern neighbors encroached on the celebratory moment. 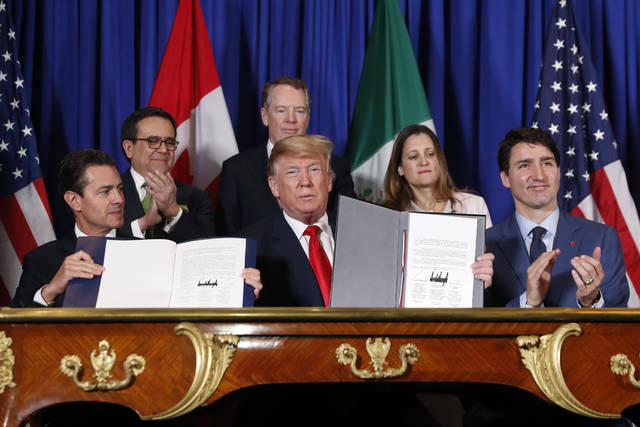 While Trump hailed the revised trade pact, Trudeau was more measured and used the event to call on Trump to remove the steel and aluminum tariffs the U.S. slapped on Canada and Mexico. Trudeau also referenced recent downsizing by General Motors in North America as a “heavy blow.” Trump did not mention the job losses. The signing came at the front end of two days of tough diplomacy for Trump. On the top of his agenda is a Saturday dinner meeting with Chinese President Xi Jingping. which will determine if the two can ease escalating trade tensions. Before Trump arrived in Argentina he injected additional drama into the proceedings by canceling another high-stakes meeting, with Russian President Vladimir Putin. On Friday, Trump opened the day with a cordial meeting at the Casa Rosada with Argentine President Mauricio Macri, a longtime business acquaintance. Posing for photos in the gilded Salón Blanco, Trump spoke about their longtime personal relationship and said they would discuss trade, military purchases and other issues. Trump, who arrived in Buenos Aires late Thursday, barreled into the two-day meeting by announcing via Twitter that he was canceling a planned meeting with Russian President Vladimir Putin over Russia’s seizure of Ukrainian vessels. His agenda for the weekend includes meetings with world leaders, as well as a number of heavily choreographed group activities for the gathering of leaders of rich and developing nations. Trump faces a series of diplomatic challenges over the weekend, most notably whether he can strike an agreement with Xi. But Trump publicly announced his decision to effectively give the prince a pass in the name of “America First,” making vastly exaggerated claims of Saudi military contracts and investments in the United States. The president also views Saudi Arabia as a vital counterbalance to Iranian influence in the Middle East. Leaders of the world’s biggest economies have gathered in Buenos Aires for the annual Group of 20 Summit to discuss some of the most important issues facing the global economy, from the future of work and food security to U.S. President Donald Trump’s trade war and the Khashoggi killing. And although their host, Argentine President Mauricio Macri, probably won’t want to talk about the dire state of his country’s economy, heads of state need only use a cash machine to see evidence of it. A U.S. dollar worth just 20 pesos in April today converts into almost double that, making the Argentine currency the world’s worst performer this year. We’ve been following the ebbs and flows of the Argentine economy for two decades and are currently wrapping up a book on economic and fiscal policy in Argentina, Brazil and Chile. Here’s a quick look at what went wrong and how it could get better. For Argentina, it’s more of the same. The country has suffered through many economic crises in recent decades. And pretty much every time, the catastrophic meltdowns ended with some combination of unsustainable national debt, high unemployment, rising poverty rates, looting, bank runs, capital flight and hyperinflation. That in turn set the stage for the next economic crisis. But it didn’t have to happen this time. Only two years ago, Argentina’s leadership had appeared to learn lessons from the past and were governing the economy pretty effectively. Capital controls helped stabilize the peso and strengthen the financial sector, while prudent government spending helped reduce poverty. Consumer spending grew and unemployment and income inequality fell. So when Macri became president at the end of 2015, there was a foundation of beneficial policies in place that supported the government’s coffers – as well as some challenges. Foreign investors, concerned about the government’s ability to meet its obligations, began dumping short-term central bank debt. Meanwhile Argentines, acutely aware of any whiff of economic trouble, began to get rid of their pesos too. Argentina immediately drained $15 billion of the IMF’s money trying to stabilize the peso. It succeeded, but, to keep the peso from falling further, the central bank has been selling tens of billions of pesos worth of bonds at yields as high as 70 percent – the highest in the world. Fortunately, there’s some room for optimism. Finding its way out of this mess, however, depends on whether Argentina follows through on the IMF’s condition to eliminate the budget deficit by 2019. This is a modified version of an article originally published on Oct. 12, 2018. Disclosure statement: Luis Gómez Romero does not work for, consult, own shares in or receive funding from any company or organization that would benefit from this article, and has disclosed no relevant affiliations beyond their academic appointment. Partners: University of Wollongong provides funding as a member of The Conversation AU. Five months after he won a landslide victory in Mexico’s 2018 presidential election on promises to “transform” the country, leftist Andrés Manuel López Obrador will be sworn into office on Dec. 1. The prolonged transition period – currently one of the the world’s lengthiest – has given Mexicans a preview of what presidential leadership will look like under López Obrador: aggressive. Since its July 1 general election, Mexico has effectively been run by parallel governments with very different agendas. President Enrique Peña Nieto, Mexico’s conservative and highly unpopular outgoing leader, has all but disappeared from the public eye, even as tensions with the United States over the treatment of Central American migrants run high. Meanwhile, López Obrador has been increasingly visible, offering asylum and temporary work permits to refugees, pushing his legislative priorities and deciding the fate of major infrastructure projects – though, strictly speaking, he cannot follow through on any of these decisions until after his inauguration on Saturday. The president-elect’s disregard for constitutional restrictions has many political analysts in the country, myself included, concerned about how he will use his executive power once in office. Since July, López Obrador has unilaterally called two “people’s polls,” circumventing a constitutional requirement that all popular referenda be approved by the Supreme Court and administered by the national election authority. In October, his Morena party hired a private polling firm to ask Mexicans in 538 towns near the nation’s capital to vote on whether to cancel Mexico City’s controversial, extravagantly over-budget and environmentally disastrous – but much-needed – new international airport. Seventy percent of the nearly 1.1 million people who cast their ballots wanted to scrap the $13.3 billion project, which López Obrador had harshly criticized on the campaign trail. Opposition lawmakers and protesters retorted that Mexican law requires a 40 percent voter turnout for a popular referendum to be considered binding. López Obrador polled 1.1 million people in a country of 130 million. 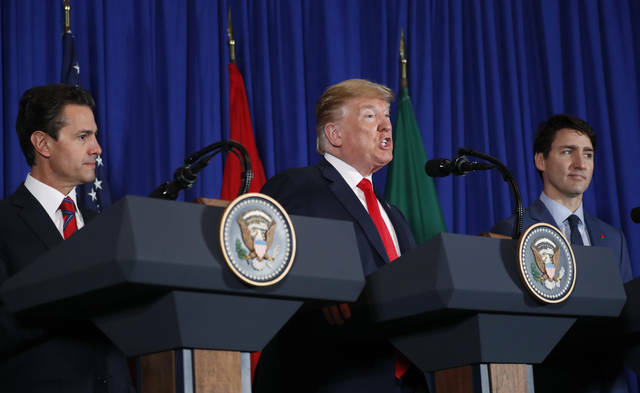 Nonetheless, the president-elect immediately announced the termination of the airport project in favor of revamping an unused military airport north of the capital. As engineers, academics and the business sector also denounced the decision to scrap the new airport, the Mexican peso plummeted amid investor concern about national stability. A month later, López Obrador’s transitional government called another unconstitutional referendum to decide the fate of another major infrastructure project. In late November, 900,000 voters determined that the Mexican government should build the “Maya Train,” a 932-mile rail line that would connect five southern Mexican states and the Yucatan Peninsula. Not consulted prior to the referendum: the Mayan communities traversed by the proposed railroad and who, by law, must be included in all decision-making that impacts their indigenous territories. Nonetheless, López Obrador has declared that the rail project will be completed by the end of his six-year term. López Obrador’s misuse of direct democracy to expand his executive powers while not even president sends worrisome signals about how he will govern Mexico. The Mexican presidency is already an enormously powerful office. It was designed that way in the 1920s by the authoritarian Revolutionary Institutional Party, known as the PRI, which ruled the country virtually uncontested for nearly the entire 20th century. After 80 years in power, the PRI lost the presidency in 2000 but was restored to power with President Peña Nieto in 2012. López Obrador, a former Mexico City mayor who has unsuccessfully run for president twice before, won this year in large part because he promised to make Mexico’s centralized, stagnant political system more inclusive and consultative. He pledged to root out corruption, reduce violence, restructure Mexico’s energy sector, respect the human rights of migrants and spur growth in the country’s most impoverished areas. Legislatively, López Obrador will have the power to push through his transformative agenda. His political party, Morena, secured majorities in both the Mexican Senate and lower Chamber of Deputies in July’s election. That also gives López Obrador the right to replace up to two justices on Mexico’s Supreme Court. But some recently announced policies have surprised Mexicans who thought they elected a leftist champion of workers rights and social inclusion. As part of his plan to slash public spending and eradicate corruption, López Obrador has released an austerity budget that includes laying off 70 percent of non-unionized Mexican government workers. An estimated 276,290 public employees will lose their jobs, according to Viridiana Ríos, an expert on the Mexican economy. Bureaucrats who remain will be asked to work from Monday through Saturday for over eight hours a day. López Obrador justifies the downsizing by quoting Benito Juárez, the celebrated indigenous president who ruled Mexico from 1858 to 1872. Juárez thought public officials should live in “honorable modesty,” avoiding idleness and excess. Few doubt that Mexico’s government bureaucracy is bloated, and that expunging the rampant corruption of Peña Nieto’s PRI party will require serious restructuring. However, the working conditions López Obrador proposes violate Mexican labor standards, which guarantee job security and an eight-hour work day. There’s a logistical problem here, too. Implementing López Obrador’s ambitious policy agenda asks a lot of Mexico’s federal government. The president-elect now intends to transform his nation with an underpaid, overworked and understaffed bureaucracy. López Obrador has angered other supporters by breaking a key campaign promise. As a candidate, López Obrador pledged to reduce violence in Mexico by de-escalating the country’s war on drugs. Rather than using soldiers to fight crime, as Mexico has done since 2006, he said he would professionalize the Mexican police and grant pardons to low-level drug traffickers willing to leave their illicit business. But voters recognized the sound logic behind his diagnosis. Numerous studies show that Mexico’s military crackdown on organized crime actually caused violence to skyrocket. The number of criminal groups operating in Mexico surged from 20 in 2007, the year after the full-frontal war on drugs began, to 200 in 2011, according to the Mexican university CIDE. By last year, Mexico had 85 homicides a day – the highest murder rate since record-keeping began in the 1980s. López Obrador has since radically changed his strategy for “pacifying” Mexico. On Nov. 14, the president-elect released a National Security Plan that continues to rely on the Mexican armed forces for fighting crime. Lawmakers from his Morena party have introduced a bill to create a National Guard, a new crime-fighting force that would combine military and civilian police under a single military command. Mexican political pundit Denise Dresser has dubbed López Obrador’s strategy as the current cartel war “on steroids.” Security expert Alejandro Madrazo wrote in The New York Times that the decision is a “historic error” that squanders the opportunity to have a national dialogue about the role of the military in law enforcement. Mexicans gave López Obrador a mandate to revolutionize the government so that it finally works for them. The president-elect’s power grabs, austerity budget and U-turn on security are early signs that he may not deliver the transformation they so eagerly await.